Notice that I say “a HEALING night’s sleep,” which is quite different from getting a regular night’s sleep. A healing night’s sleep means that you need to get approximately eight hours, which is easier said than done for many. Menopause, anxiety, allergies, sleep apnea, and a plethora of other conditions might prevent you from getting the sleep you need for your body to heal. According to Matthew Walker, Director of the Center for Human Sleep Science at the University of California, Berkeley, too little sleep affects our health, our energy levels. I’m lucky in that I don’t have a problem getting a good 8 hours, but my husband does. He’s struggled with insomnia since he was a kid. So, he’s recently been putting some of my tips into practice, and he is MUCH improved. So – In (day)light of our clocks springing forward this week, I’ve decided to share some of my healing sleep tips this week! Like anything that you want to improve, it takes a little bit of thought, and a lot of discipline. But it’s SO worth it. Here are my 10 tips for a healing night’s sleep. 1. Wind Down Early: You need to give your body a chance to cycle down before bed. This means shutting down work, computer, TV, social media, etc. at least 30 minutes before you hit the sack. The light from many of these devices can prohibit your pineal gland from releasing the hormone melatonin, which helps you sleep. Moreover, the stimulation from our TV’s and devices doesn’t help with the winding-down process. 2. Go To Bed An Hour Earlier: I recommend actually planning to go to bed a full hour earlier than you usually do. You might be amazed how well this works. This has been the best thing ever for my husband because that extra hour really counts, especially if he wakes during the night, or in the early hours. That one extra hour can top off his usual 6 or 7 hours up to the requisite 8. 3. Melatonin: I’m a huge fan of taking a melatonin supplement for occasional sleeplessness. It’s a drug-free option, which could really help you during phases of sleeplessness. I never travel without a trusty bottle of Natrol Melatonin Fast Dissolve because I otherwise suffer from horrible jet lag, especially when I travel to the U.K. This little pill is strawberry flavored and dissolves under your tongue. I take 5 or 10 mg about 20 minutes before going to bed, and never wake up groggy. 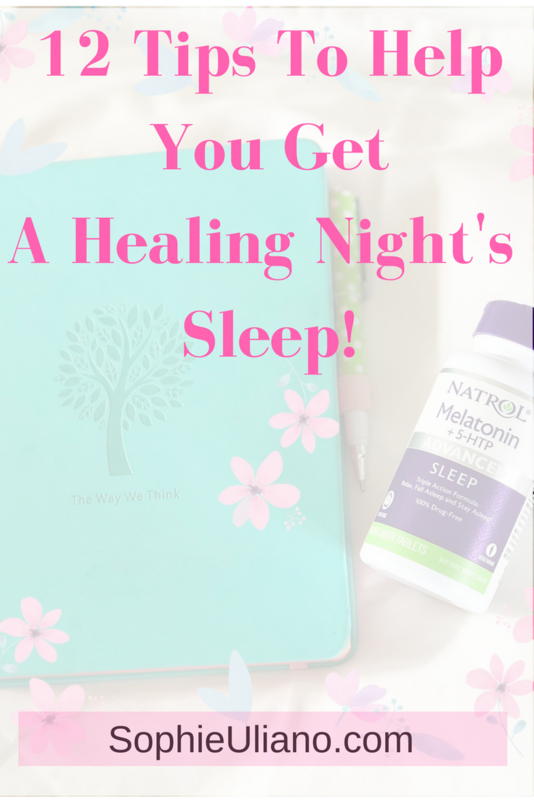 In my experience, Melatonin helps to soothe the “falling asleep” process! 4. Tech-Free Bedroom: You’ve heard it before and you’ll hear it again, it’s best to keep electrical gadgets out of your bedroom. Instead of a digital alarm clock, I have one from Now & Zen, which wakes me up with a soft chime. Unfortunately they don’t make this model anymore. I charge all of my devices outside of the bedroom. And instead of reading on a tablet, I read a real book – there’s something about reading a paperback book that lulls me to sleep. I try to read fiction at night, rather than research books (which I have stacked up in my office), because I want slow down that part of my brain. 5. Air Purifier: If you suffer from allergies, you might want to invest in a really top notch air purifier for your bedroom. It can make a huge difference. Having tried about three very expensive models over the years in my daughter’s bedroom, I’ve now come across the best of the best. The Intellipure is far superior to any other purifier I’ve tried. If you’re looking for a good one, check out their website to read all about why it’s probably one of the best on the market. 6. Sleep/Pillow Spray: My daughter swears by this spray. I made it for a TV segment, and gave it to her when I got home as she was going through a phase where she found it hard to go to sleep. Now she can’t live without it, and I have to make a giant new bottle every few months, and little bottles for when she travels. Here’s the recipe. 7. Magnesium: Magnesium helps a lot of people sleep including me. It’s now become part of my bedtime routine. I take my magnesium supplement at night after dinner. 8. Kiwi Fruit: Eat a couple of kiwi after dinner. Studies have shown that they could significantly help with insomnia (another of my husband’s favorites), plus they are packed with Vitamin C.
9. Meditation: You can meditate in the evening in that wind down hour before bed. It will calm your racing mind, and might significantly help you. My 94-year-old dad can now drift into a deep slumber (when he used to have terrible trouble) because he’s religious about his meditation. 10. Sheets: It might sound silly, but beautifully soft and silky sheets make all the difference for me. Admittedly, they don’t make me sleep differently, or cure insomnia, but they go a long way to make me feel luxurious in my bed. My favorite sheets in the world are bamboo from the Bamboo Sheet Shop. 11. Temperature: Almost all sleep experts agree that you are better on the cooler side, and that your bedroom temp shouldn’t exceed 68 degrees F (this is where my husband and I struggle – I love a COLD bedroom and he doesn’t!). 12. Herbal Tea: There are many sleep teas on the market, but it’s very easy to make your own! I love a warm cup of soothing tea before I hit the sheets. Thank you to Natrol for partnering on this sponsored post, all opinions are my own.